Hey PooK, I just happen to know a couple of guys that might be able to do some glass work. As a favor to you I will stop by on the way back from Harlan county KY., pick up your molds, and see if they can make what YOU need. Thats what ime talkin bout driver. I'm not sure how you did that Marty, but the mufflers got here yesterday! Only problem I had was getting the fed ex guy out of the shop...lol! Must be a distribution whse close by, I just specified standard ground delivery. Maybe the word is spreading of who you are, how you conduct business and the amazing results from your talents. You should consider selling tickets for exhibit sessions. OK, I answered that question B-T and I had on the prototype..."Do the ball joints and bushing come out so the Arms can be powder coated?" Yes as long as you make three separate tools to do the job. Also took the liberty to crop circle the lowers Marty, Hope you don't mind. Loading the truck for the REST of the powder coating. Looks cool. Will the powder coat handle the heat of the calipers? Wow you guy's remember when we gave a crap about craftsmanship in the USA? Oh well, stripped and cleaned up all the welds Marty. No wonder McGard charges so much for our stuff, we'd never let crap like that out our door. On the ceramic coating I'm wondering if I should wait till the engine is tuned in just in case it gets too hot before curing? I do have a shop that does ceramic coating that is only about 30 minutes away. 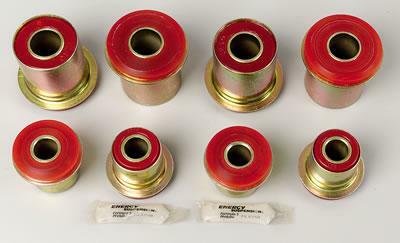 One ughhh about the Energy Suspension bushings. The TR-42 uses two sets of rear lower control arms and two sets of front upper control arms, right? Well, the bushings are only sold in sets for either the front or the rear, which means I'd have to buy two rear sets, #3.3193R, (to get the bushings for all the lower control arms) and two front sets, #3.3192R, (to get the bushings for all the upper control arms). That'd be about $250. I'm willing to bet there are only three style bushings, one upper style and two lower style (each lower takes one of each). If you look at the first pic there are three different bushings. Another word, The arms are the same front to rear except the shape. I think I have a deal forming to get a set of exactly the pieces we need, in RED too!